Colorful, attractive mixture of micros with different textures and shapes. 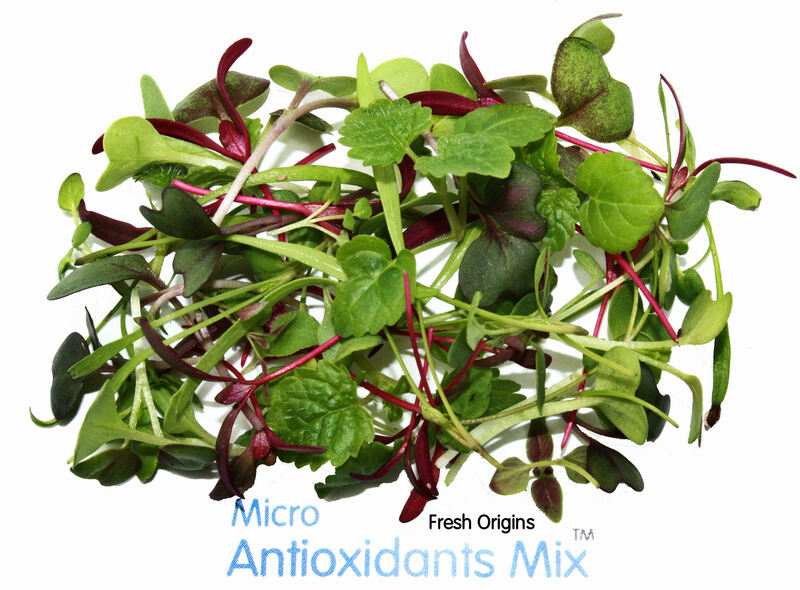 Our Micro Antioxidants Mix contains micros with the highest levels of antioxidants! These include: broccoli, cabbage, dill, kale, lemon balm, marjoram, oregano, radish, savory and thyme. This combo boasts fresh flavors of citrus, spicy flavors of radish, intense herb flavors, and hearty flavors of cruciferous veggies. Antioxidants are substances that may protect your cells against the effects of free radicals. They can help to maintain health and prevent diseases such as cancer and heart disease. Eating these tasty MicroGreens is a fun and simple way to get these crucial vitamins into your body. Boost your antioxidant intake even more with meals that include berries! Few fruits have quite the provocative allure, the fragile charm or the nutrients of berries. They’re full of fiber, minerals and vitamins, and loaded with healing antioxidants. Cut pork roast down the center (not all the way through) to make it into a thinner flat piece. Add 1 package of cranberries and feta to the center of the meat (like you are making a burrito). Then take the two side ends and bring them together. Tie up the whole roast with 4 pieces of twine. Season with salt and pepper. Add olive oil and butter to the top. Add chicken stock to bottom of the baking pan. Bake for 10 minutes at 400 to get the top crisp. Then for 45 minutes at 350 or longer depending on your oven. In a small saucepan, add 1 package of cranberries, butter, oilive oil, sugar, red wine, salt, and cinnamon. Simmer for 30 minutes or until the consistency is thick and the wine is reduced. 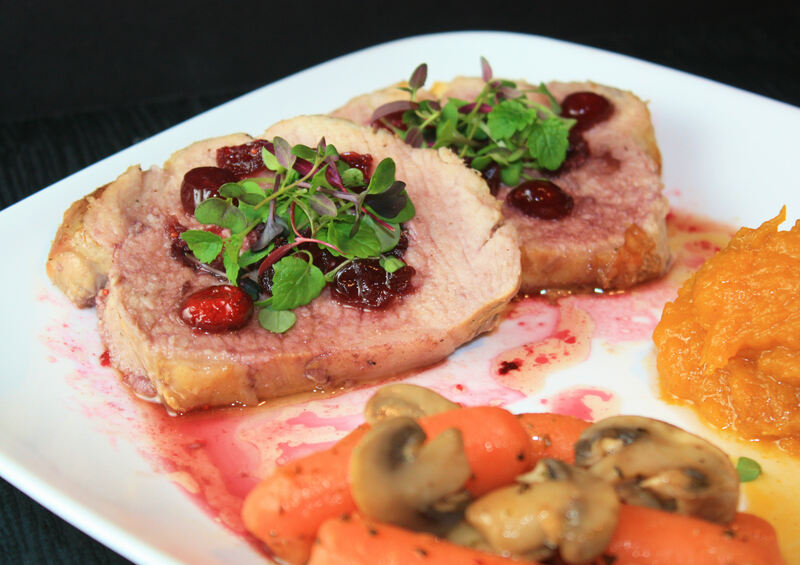 When pork is done, slice it and add the cranberry reduction on top. Serve with a side dish of your choice and garnish with Fresh Origins Micro Antioxidants Mix! Put whole blueberries, blackberries, raspberries and sliced strawberries into a bowl, add 2 tablespoons Grand Marnier and granulated sugar, stirring to coat every berry. In a separate bowl, add berries and 2 tablespoons Grand Marnier and mash mixture. Combine mashed mixture with whole berry mixture. Place in the refrigerator for 45 minutes to an hour to let berries macerate. Mix every 20 minutes or so and add more sugar. You’ll know when they are ready when a thick syrup begins to form. While waiting, combine mascarpone with Grand Marnier and Sugar and set in refrigerator. When the berries are almost done, crack an egg and separate the yoke and the whites. Brush the edges of the crust with the egg yoke. (This will give the edges a nice golden brown color when baked). Bake tart crust for 10-12 minutes with a temperature of 450. When crust is done, let cool for 15 minutes. While waiting, combine mascarpone mixture with berry mixture. When crust is room temperature, remove it from its outer baking shell. Then plate crust and fill the center with the mascarpone and berry mixture. Add fresh berries to plate, surrounding tart. 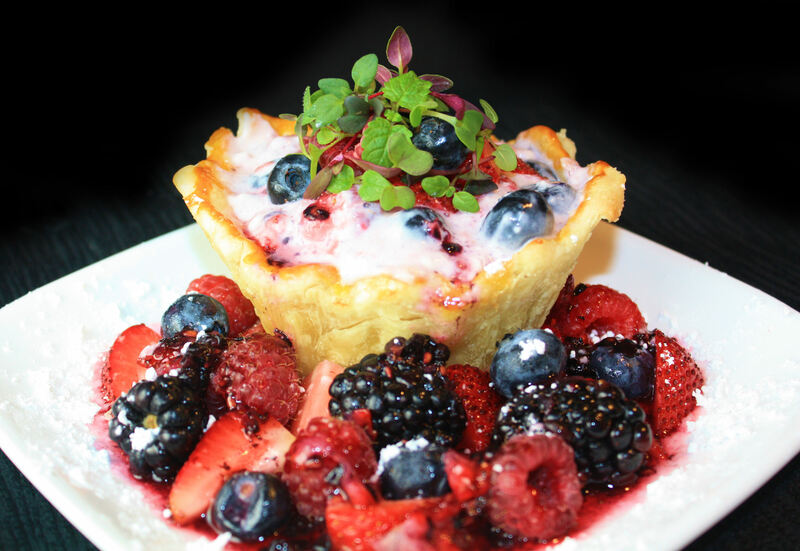 Garnish tart with fresh berries and Fresh Origins Micro Antioxidants Mix.